Had a fun 3/4 wr in Saturday afternoon (including 1 in Chappy, I was last alive on my team and used island cover to hide out the remaining 45 seconds from Richy and chappy), then just over half my evening matches losses because potatoes galore. At least got enough wins for the Aigle missions except 150 MB hit and win one, that probably I'll skip. Didn't play yesterday since worn out from celebrating sister's bday. Saw Herr_Reitz one match and said hello. He didn't notice until watching replay because mouthy trash-talker flooding his team chat. Div'd up with a couple guys from 90th while checking out their clan. Apparently they liked my tactical minimap awareness. After buying back Tashkent I'm broke again. Ugh! Can already predict how Missouri's beard grows! My weekend had its up and downs. 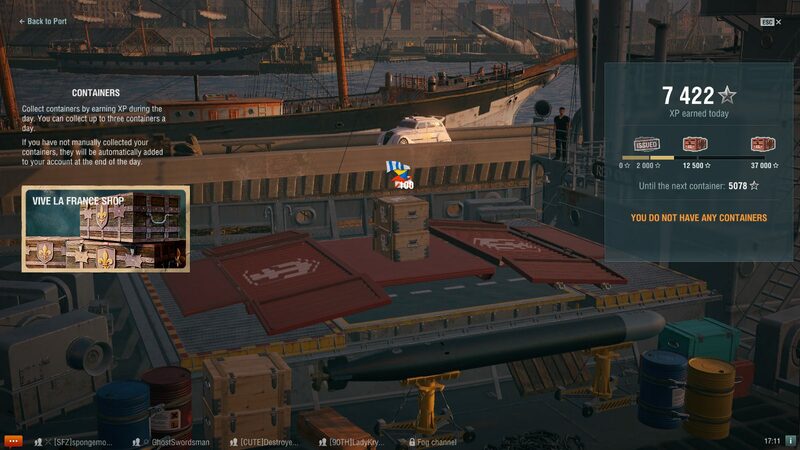 The up was that on Friday I got the Perth from a super container. The downs: Friday I played CV a lot, not only to easily get the 30 planes shot down, but to have CVs be in game for others to run the mission. And man, when you guys want to shoot down planes, you can shoot down planes! I was deplaned EVERY game on Friday. Saturday was cap aversion day. 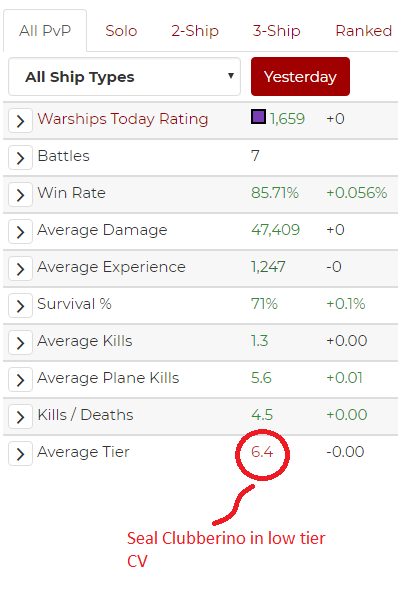 Only thing I can add is that my best round ever in a CV was a Kraken and a loss. Eh, had a horrible time with the Alsace after 2 great games. It seems either 6 ships focused fired on me or the other flank collapsed and now it's 4 vs 1. Had great game with the Perth though. It could have been worse. It could have been better. I did accomplish the Aigle tasks to remain current on that series. I also made significant progress on Mission 2 of the Gold of France campaign. Unfortunately, winrate and survival metrics took a hit. Had enough free exp to get Musashi, since I already have Yami, not big deal except did enjoy shooting at tier 7 wtih those big guns when top tier. After opening over thirty two French Crates through the missions, did finally land a BB mission for the Bretagne. Took it out for a few battles for test drive and was not impressed. Felt it was the weakest of the tier 5 BB with lousy guns. Ended up free exp’ing the rest of the grind to the Normandie. One game and not impressed either. Have all the tier 6 BBs and this might be the worst. Will have to decide if grind is worth it, have lots of great BBs, not sure if I want to bother with a new group of Meh boats. Also, was teamed up with several “fail” divisions this weekend. Was like having a moving afk on the team. Important safety tip, if you do not want to be in a tier 10 game with a Pensacola, don’t division with a tier 8 buddy. Same thing goes for a Kirov in a tier 8 battle. Please tier the same level if you are divisioning. Was okish. Got the Aigle missions done without losing a game and spend most of the WE in operations to grind from the Richi to the Elsass. Some of those matches were terrible but most ended with a 5 start win. Sunday was much worse then Saturday. Some cruiser player should be happy that there is no team damage in operations. Got my Elsass today (still missing Lothringen ) and the new French captain is on his way to the 18th point. Mostly not good due to terrible frame rates and lag and ping spikes. Some games was just a slide show. Had to re-start numerous times to fix it and it kept coming back. Really bad lag and stutters...not exactly good time to play. 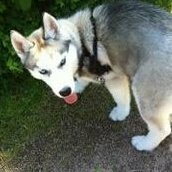 Stuttering has been acceptable for me for the most part. Played some random battles and had some good games, but spent most of the weekend (which was covered by reward Premium time) pillaging Hermes to grind to New Orleans. I went 10-0 on Saturday, then mucked it all up on Sunday. I got mostly screwed up by a snowstorm that damaged my ISP's tower Friday night. Internet was sketchy all weekend. I picked up the Fiji and Des Moines, but never got the chance to really try them out. I did play one game in my Kamikaze where I got a double-strike on two enemy DDs, then got dropped and had to completely restart the game. 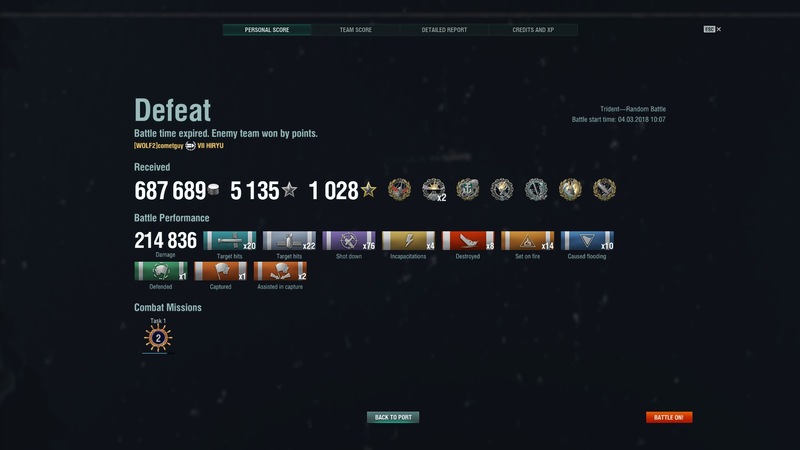 When I came back in, I was still alive, so I went and sank three BBs for a Kraken. Not all that good. Playing a bunch of new to me T9s, as well as grinding up some other lines. Had some real potato teams, but I was in a funk myself. I got 3 dets over the weekend, 2 in a row in my fletcher, that was amazingly fun, was probably at 60-70% health both times, other was in a BB I think but I was almost dead any way. Had an hilarious mid-tier match where an enemy fushun got with 5km of both our CVs, killed one, then died when he tried to ram the other CV, our CV got die hard, both teams were lol at this tool. CV has to be the EASIEST class to play and can earn just crap tons of credits for no reason.